New plant lamp generates light with the power of... bacteria? Reliable electricity and artificial light sources might be so commonplace in the western world we barely pay them a thought, but for those living more remote regions across the world, having a reliable electrical infrastructure isn't such a sure bet. And for villages such as Nuevo Saposoa in Peru is prone to intense bouts of flooding, making a stable electrical grid near impossible to construct. But for the folks at the Peruvian technology institute UTEC, the answer lies in something as simple as bit greenery. And while they're new innovation isn't a sunflower with light bulb growing out the top, the reality is just as intriguing. The team built a metal grid inside a large planter that captures the energy given off by electron-releasing micro-organisms called 'geobacters'. The energy given off by these bacteria are then storied in a battery, which can provide up to two hours of light per day. That's two hours of artificial light from a single plant. 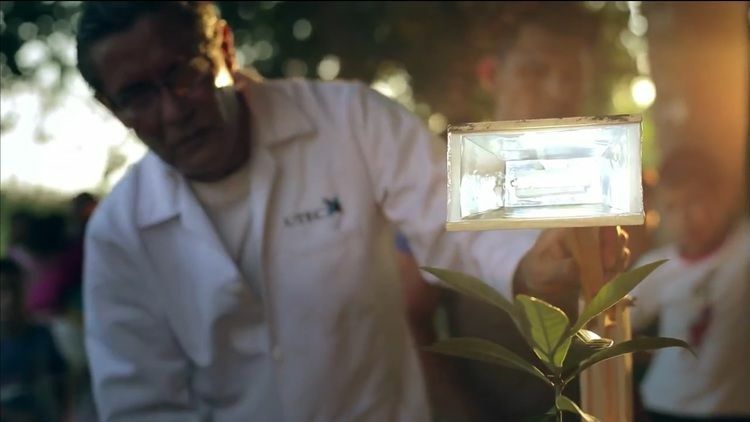 And while the technology isn't anywhere near the scale needed to roll it out on a mass market scale, the ten prototypes that have currently been built are already providing the occupants of Nuevo Saposoa with an ideal natural alternative to the dangers of using kerosene lamps.